While most current studies on law and politics in Israel focus on the legal aspects of public policymaking within the courts, this book explores the relationship between law and government from a positive perspective. That is to say that the question asked is: how the political relationships between the three branches of government affect public policy and hence social outcomes. 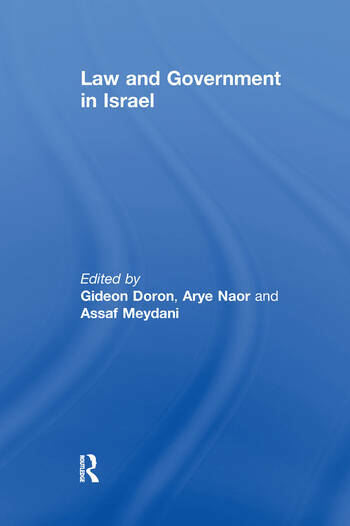 The eleven contributors to this volume concentrate on Israel from theoretical, comparative and critical approaches, and hence the analysis presented could as well be applied to other polities. Gideon Doron teaches in Tel Aviv University and is the president of the Israeli Political Science Association. He is the author of 17 books and dozens of articles on political economy, public policy and administration, electoral systems and political communication. He served as a chairman of the board of the Second Authority for Television and Radio, and headed several state commissions. He initiated the "President Commission for the Examination of the Structure of Government in Israel". He is the chairman of the "Total Representation" association for electoral reform. Arye Naor is Professor Emeritus at the Department of Public Policy and Administration, Ben-Gurion University, Israel. Between 1977 and 1982, he served as secretary to the cabinet in the Menachem Begin government. The author of eight books and dozens of articles on politics, ideology, government and policy in Israel, currently he is the chairperson of the Academic Committee of the Jabotinsky Institute in Israel, and vice president of the Israeli Association of Political Science. Assaf Meydani is a Senior Lecturer in Public Policy, Politics and Law in the School of Government and Society at the Academic College of Tel Aviv-Yaffo, Israel. A lawyer, he has served as a member of several public policy delegations including the Committee for the Nomination of Judges of the Zionist Supreme Court. The author of four books and several articles, Dr. Meydani was also a member of the Information Delegation during the Camp David negotiations in the year 2000.